Great, spacious bathroom, useful extras like a fridge and a kettle. Easy to get there by car .Room is decently roomy.TV set is ok.Bathroom is nice. Very friendly staff and clean rooms. Room quality was very good. Despite it's called a 'motel' you can count on everyday room service while you're absent. There is quite good view through the window. You will also find beautiful countryside on the way to the train station. The rooms are nicely furnished and presented. Staff are helpful and friendly. Big shower, big bed, big television and a refrigerator. Everything is new: building, windows, furniture and facilities. 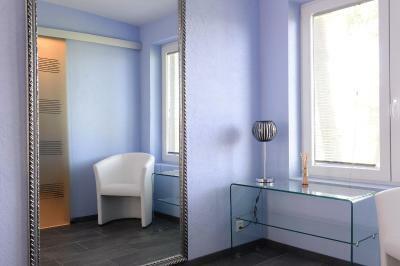 Good design of rooms and showers with washrooms. 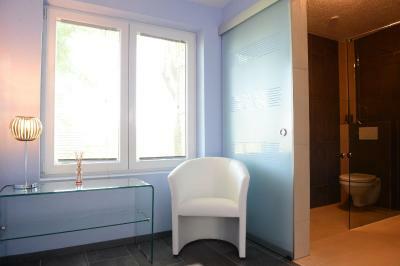 Showers with washrooms are private inside rooms. 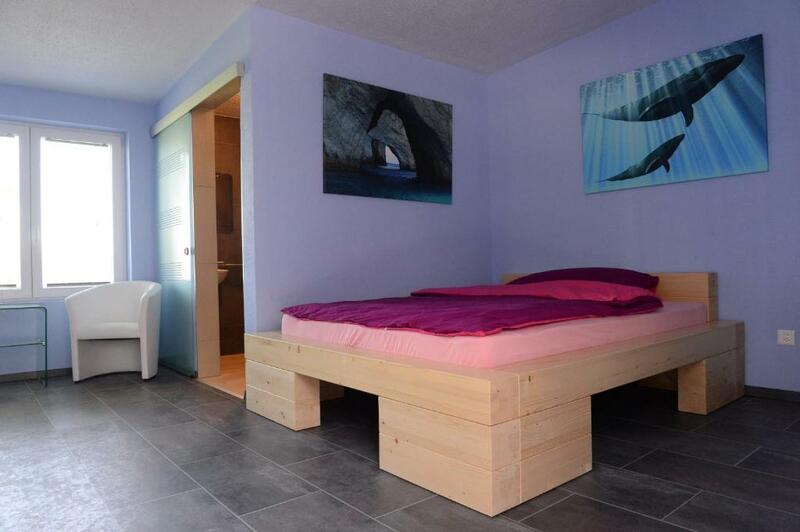 Schöne, moderne Zimmer. Freundliches, sehr hilfsbereites Personal. Nehmen sich den Anliegen an. Etwas Zuglärm (gleich neben an). Ca. 15 min. Fussmarsch zur nächsten ÖV-Haltestelle. 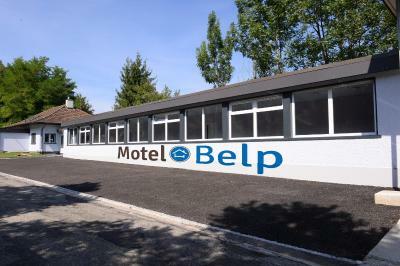 Motel Belp is offering accommodations in Belp. Free WiFi is available. At the motel, all rooms come with a desk. The private bathroom is equipped with a hair dryer. All guest rooms feature a closet. 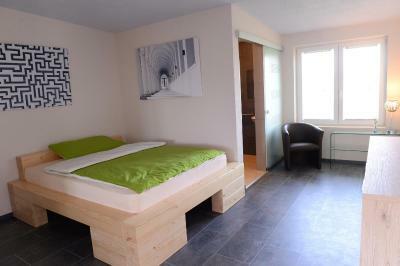 Bern is 6 miles from Motel Belp, while Fribourg is 23 miles from the property. 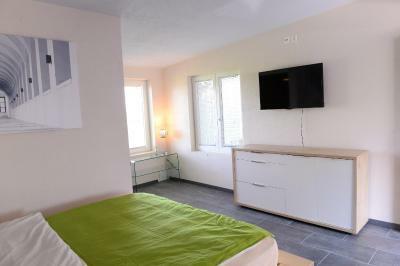 The nearest airport is Belp Airport, 3 miles from the property. When would you like to stay at Motel Belp? House Rules Motel Belp takes special requests – add in the next step! 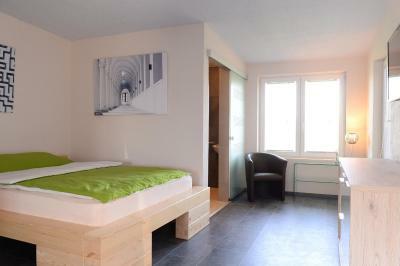 All children under 16 years are charged CHF 15 per night for extra beds. Motel Belp accepts these cards and reserves the right to temporarily hold an amount prior to arrival. Even closed windows let the train noise through, no tea or coffee with the kettle and the night club next door made the location seem a bit dubious. No electric kettle in the room. Trains in close proximity although it looks like they do not bother much at nights. Pillows are bad, should be replaced with ones made of memory foam to achieve perfection. It's quite far from the nearest train station (over 1 km) and you will find it quite hard to get there by foot. There is no sidewalk on the way. I had to travel using bike lane and pay attention to the traffic all the time. You should be very careful if you can't sleep when it's noisy. This motel is right next to the railroad tracks. The last train is passing by about midnight. The bathroom lights work on sensors (no switches), and the lights had a tendency to go out in the middle of taking a shower, leaving you in the dark. With one bathroom, the water spilled on to the bedroom floor. There is a railway track which runs beside the building, which is very noisy in the mornings. There is no breakfast provided (of which we were aware from the outset). Expensive, next to a whorehouse (same owner), reception doesn't speak German, Englisch or Frence, only Hungarian. Location of the motel is sinister. Every 5 minutes there is a train coming by at a distance of less than 5 meters. A lot of noise. No airconditioning, the window opens only a little, so no ventilation. It was 37 degrees inside during my stay. The shower was great, only the water flew into the room instead of the drain... No breakfastfacilities at all. Bed was hard. The property did not feel secure. There is no public transport available, only to the Bahnhof of Belp. Advice, don't do it. Hot without aircondition. Can't open enoth window. Didn't feel secured enoth. Wide slot at the toilet and shower door.